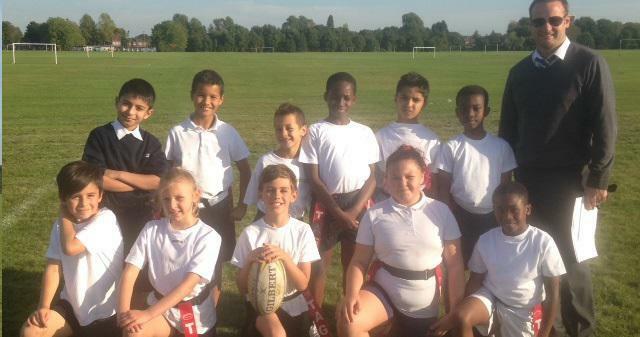 Tag Rugby is played in school as an extracurricular activity. A huge well done to our wonderful Tag-Rugby side who competed in the City Wide Final tonight against some extremely strong sides from the city of Manchester. There are 135 schools in the city and tonight St.Mary's came third. The competition started well for us with a good win against Moor Allerton. Then we played a really strong St.Edmunds side who we failed to beat. Next up was St.catherine's who we beat by one try and finally we played against Moston Lane who we beat well. After a quick count up, the organisers announced the four semi-finalists..... Beaver Road, St. John's Chorlton, St.Edmunds and ourselves.Tag Rugby is played in school as an extracurricular activity. Playing Beaver Road was really tough because they played really brilliant rugby. They moved and passed the ball from side to side with lots of skill. We lost the game 5-4 but knew we were in the 3/4th play off. This game was against St.Edmunds who had already beat us earlier. Again this was a tough match but we just came through winning by two tries. So, we came third in the city...,..brilliant. Well done to all the team who were captained really well by Jacob. 3rd place is wonderful! !